“I am quite thrilled. I am very excited to see where they will take our songs. I am also happy that a very young cast is performing them. The script, staging, and the music seem fresh and new. I hope the Filipino theater audience loves it,” says Jim Paredes, APO Hiking Society member. Director Robbie Guevara wrote the story loosely based on the start of APO Hiking Society as college student at the Ateneo De Manila University. Set in a university in the 1970s, Eto Na! 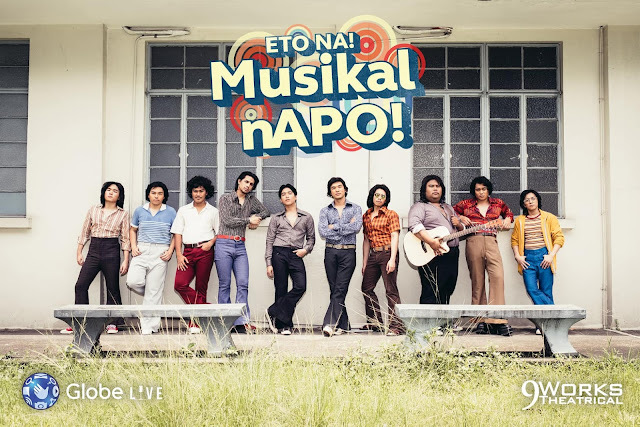 Musikal nAPO! Follows college friends hard at work to win a songwriting and singing competition. The story follows them through the ups-and-downs of youth, from artistic doubts to romantic bliss and heartbreak. All of this happens under the iron fist of Martial Law, and yet, for some of them, their spirit and passion for music thrive. “We all go through these,” says Guevara. “We all relate somehow. They go through joy and heartbreak as they come of age, told through the songs of APO Hiking Society. I didn’t exactly choose them. Things just fell into place. If you listen to their songs, you cannot not get attracted. It’s hard, but the challenge wakes you up early each day. The whole cast and crew’s sheer love for APO Hiking Society music shines, and it’s undeniably infectious," explains Guevara. 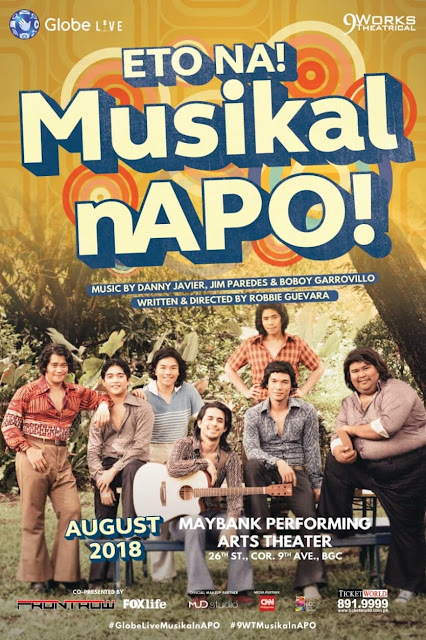 “Learning about this musical is really exciting for us because there is nothing more pleasant than to have your body of work through four decades be staged by a successfully-known production company, and be given new life in a medium that we as a group have not quite immersed ourselves in,” says Buboy Garrovillo of APO Hiking Society. He originally suggested the idea of a musical to director Guevara in 2013. “We also feel comfortable that our material is in good hands. I’m more excited now to see the production fulfill their aspirations and different takes on our music," he added. More than a walk down memory lane, Eto Na! Musikal nAPO! 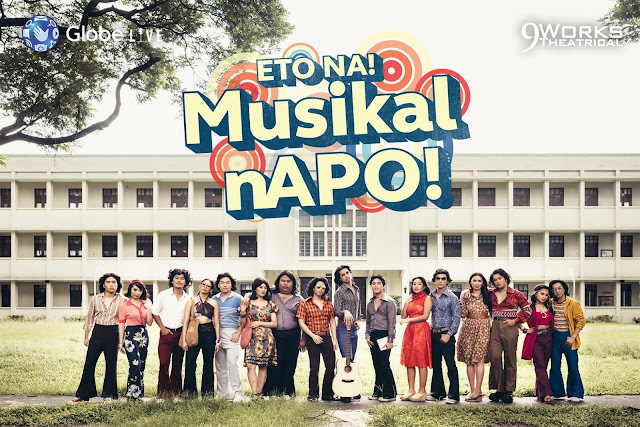 is a thrilling spin on APO Hiking Society’s songs by musical director Daniel Bartolome. 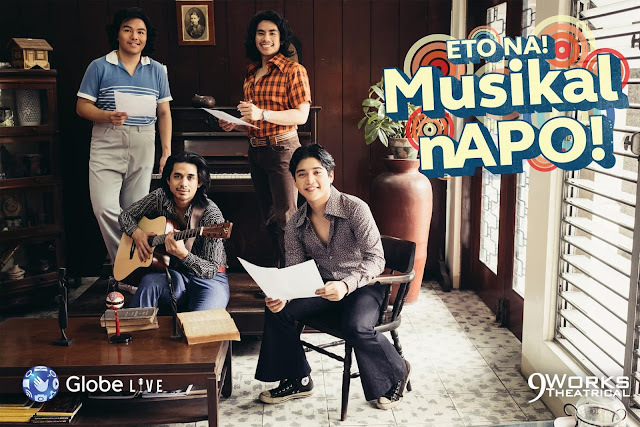 Featuring some of APO’s greatest hits like “Pumapatak Na Naman Ang Ulan,” “Panalangin” and “Paano” among others, the musical is a treat for fans and their families. Inspired by the early days of the legends of OPM, the musical is a homage to APO and their illustrious history. Even if you know the songs by heart, they won’t exactly sound the same. “You'll notice right away that something new is added to the original,” says musical director Daniel Bartolome, “There's ragtime, swing, straight rock.” The musical offers reinvented renditions of the songs with new and unexpected arrangements that will surprise even APO Hiking Society’s diehard listeners. He added, “I personally wouldn't want to touch the original arrangements. The songs are already perfect as it is. But considering that it would be used in a musical, changes have to be made. Because it’s not going to be staged as a concert. But with a story. The music is part of the storytelling. I carefully chose which to omit, which to keep and which to change to best serve the staging or the scene. Eto Na! 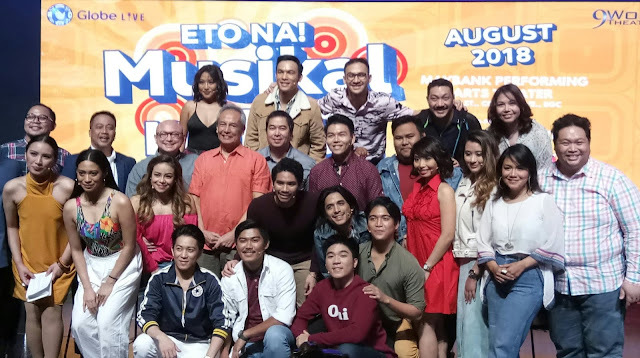 Musikal nAPO! was made with a fervent love and respect for the music of APO Hiking Society. It is a heartfelt homage to the group and how their songs have resonated with generations upon generations. It’ll be a treat for the entire family and theater lovers alike." Mark Bautista stars as the group’s chief lyricist Rick, who is also the boyfriend of Anna, played by the magnetic Rita Daniela. Part of Here Lies Love at West End in 2014-2015 and fresh from a Seattle Repertory’s staging of Here Lies Love, Bautista has been a mainstay of Pinoy showbiz, releasing 6 chart-topping albums, taking part in 10 movies, and being part of numerous musicals, both local and international, such as Noli Me Tangere. Meanwhile, Daniela, an artist at GMA, is also the first ever Pop Star Kid. She has graced the silver screen on Bahay Kubo at the 33rd Metro Manila Film Festival and Dagim at Cinema One Film Festival, where she was nominated as best supporting actress. Jobim Javier, who will be making his theater debut as the campus palikero Butch is the son of Danny Javier. Sab Jose, graduated with honors at the Guilford School of Acting in London earlier this year, plays his love interest, Michelle. Award-winning singer Alfritz Blanche is Sonny, who was part of Himala Isang Musikal, and Noli Me Tangere. The role of Jane is Filipino-Japanese actress Marika Sasaki, a GMA artist who has appeared in TV series My Guitar Princess, and Unbroken Hearts. Jon Philippe Go, also known as The Singing Chemist after being chosen by Lea Salonga in The Voice of the Philippines Season 2, is Ray. He appeared in the musical adaptation of The Little Prince, and I Remember a Boy. Jaime is Philippine Theater’s it-boy Jef Flores, two time PHILSTAGE Gawad Buhay awardee for best actor for tick… tick… BOOM! and This Is Our Youth. Part of Newsies and Mula Sa Buwan is Jon Abella, a UP Theater Arts graduate, who will play Donnie. Theater veteran Raul Montesa is Ray’s father. Last seen as Bob Cratchit in A Christmas Carol, Miss Saigon alumna, and an actor in many local teleseryes. UP College of Music graduate Neomi Gonzales is Ray’s mother, who played Chayong in Himala Isang Musikal. She also has appeared in Rak of Aegis, ABS-CBN’s On the Wings of Love and Hanggang Saan. Lush harmonies courtesy of the rest of the cast includes Gian Gloria (A Christmas Carol and American Idiot), Marco Polo (An Untold Love Story), Shalee Vicencio (A Christmas Carol, American Idiot and Dirty Old Musical), Peachy Atilano-Guevara (RENT, The Wedding Singer and Grease), Anton Posadas (Disney’s Newsies, The King & I and The Bluebird of Happiness), Jourdan Bartolome (Disney’s Newsies, A Christmas Carol and UP Filipiniana Dance Group member), and Derrick Gozos (Walang Sugat, Romeo and Juliet and Florante at Laura). Eto Na! 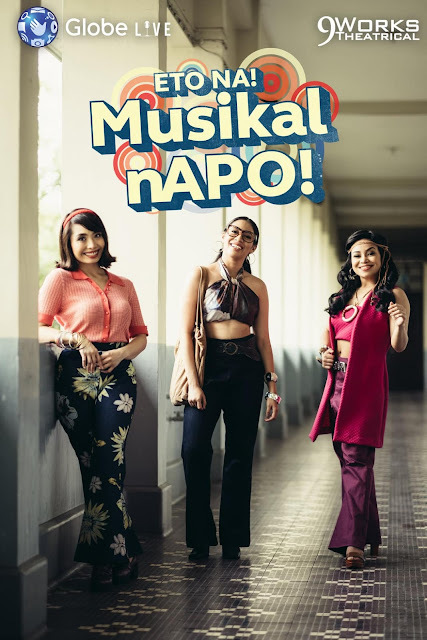 Musikal nAPO! runs at Maybank Performing Arts Theater, Bonifacio Global City, on August 3-5, 10-12, 17-19 & 24-26, 2018, at 8:00pm on Fridays, Saturdays & Sundays, and 3:00pm on Saturdays & Sundays. For tickets, call Ticketworld at 891-9999. Official Hashtags: #9WTMusikalnAPO #GlobeLiveMusikalnAPO Facebook: /9WorksTheatrical. Twitter & Instagram: @9WTonline Facebook & YouTube: /GlobePH. Twitter & Instagram: @enjoyGlobe A limited number of performances are available for fundraising and block buying. Please contact 586.7105 • 0917.554.5560 • info@9workstheatrical.com. Eto Na! Musikal nAPO! is a production of 9 Works Theatrical and Globe Live, co-presented by FOXlife and FRONTROW, with MUD (Make Up Designory) as the official make up partner, and CNN Philippines as media partner. Special thanks to BGC Arts Center. Globe Live, is set to introduce APO’s music to new generations, while bringing back golden memories for long-time fans. Photos from 9 Works Theatrical.